Think university research is abstract and boring? Think again! I love my academic job, because it combines meaningful research on global health problems with exciting travel opportunities. This summer, for example, I swapped my university office for the beautiful sea views of Cape Town in South Africa and the lush green hills of Sri Lanka. At the beginning of this year, I joined the SAPPHIRE research group at the University of Leicester to support an exciting cross-cultural project on antibiotic prescribing choices by hospital doctors. We are investigating the circumstances under which hospital doctors prescribe antibiotics and which type of antibiotic drugs they choose, in order to better understand influences on antibiotic use in different contexts. This is important because each antibiotic prescription contributes to the development of drug-resistant bacteria, which ultimately makes it harder, or even impossible, to fight bacterial infections with the antibiotic drugs available. Now, I am not a medic. My background is in Psychology, and my PhD research focused on human decision making. I don’t know exactly how antibiotics work and I’m definitely not an expert on the biological mechanisms underlying antibiotic resistance, however, you don’t need to be a biologist to understand the gravity of the problem: If antibiotic use continues at the current rate, millions of people will soon die of comparatively simple but drug-resistant infections, such as pneumonia or urinary tract infections. Antibiotic resistance is a global health threat. One solution to the problem of increasing antibiotic resistance is for doctors to use the existing antibiotic drugs more prudently, by only prescribing antibiotics when they are strictly necessary to treat an infection, and saving the strongest drugs (i.e., broad-spectrum variations of antibiotics) for the most severe and resistant infections. Enforcing more prudent use of antibiotics requires a change of prescribing culture and this is further complicated by the diffuse and international dimensions of the threat. Antibiotic resistance spreads across national borders, which is why we need a global approach to tackle the problem. Consequently, our project investigates antibiotic use across three different countries over three different continents. We aim to compare doctors’ prescribing choices in UK hospitals with those in South Africa and Sri Lanka, both of which are less developed countries that may struggle with limited resources for addressing antibiotic resistance. In order to understand the local hospital contexts, a core project team travelled to both countries this summer and met with a range of hospital physicians and national stakeholders. Luckily, I got to come along! In July 2017 my colleagues Carolyn Tarrant (Associate Professor at the University of Leicester), David Jenkins (Microbiology Consultant at the Leicester Royal Infirmary), and I embarked on an adventure to South Africa. The visit was facilitated by Shaheen Mehtar, Chair of the Infection Control Africa Network (ICAN), who extended her warm hospitality to us. We visited a public and a private hospital during our stay. Our meetings at the public hospital were extremely helpful for drawing attention to particular national challenges such as the continuous fight against the infectious disease Tuberculosis. We also learned about the existence of an Antibiotics Committee which monitors antibiotic prescribing charts and controls use of certain antibiotics. Similar to the UK, a challenge remains obtaining detailed antibiotic prescription data at ward-level. 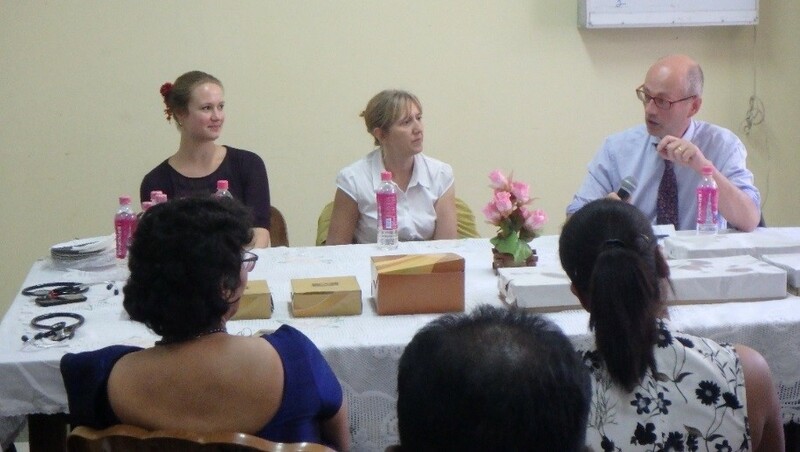 At the private hospital, we met hospital clinical managers, clinical pharmacists, and nurse managers. We learned that antibiotic stewardship is a big focus for the private hospital chain and that detailed monitoring of antibiotic use is helped by the billing process for private patients. Since every treatment dose gets captured and billed, it is much easier to identify antibiotic overuse and to work with doctors to bring antibiotic use down. 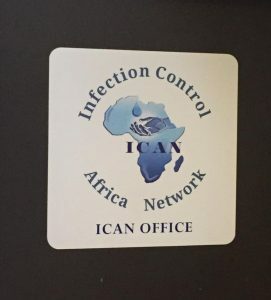 Additionally, we had many fruitful discussions with the Infection Control Africa Network (ICAN), and learned about their inspirational pan-African initiatives involving training on hand hygiene and general infection prevention, which are key to reducing bacterial infections and the consequent use of antibiotics. Overall, the trip was a fantastic experience, and I certainly learned a lot. Not only do I know a lot more about medical decision making in South Africa, I’ve also learned to appreciate a good cup of Rooibos tea. The trick is to add a splash of milk – who knew? 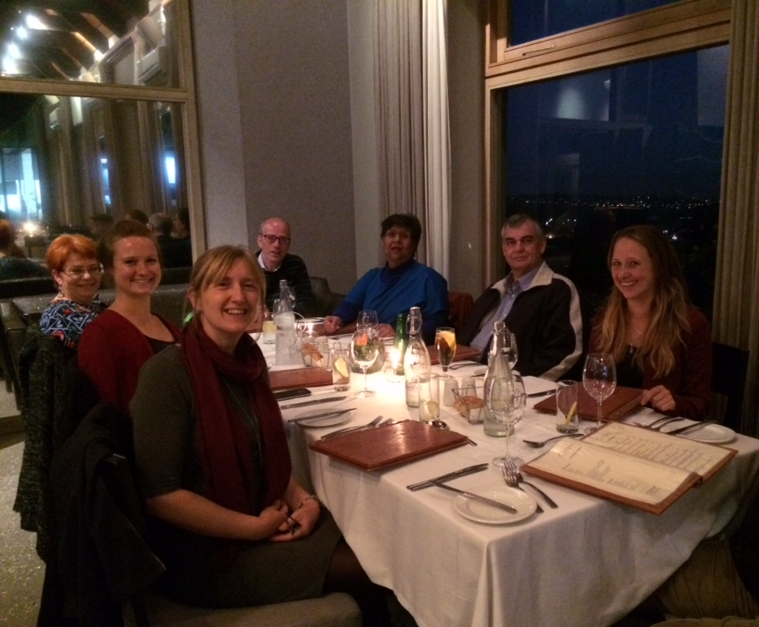 With just about a month to recover from our trip to South Africa, we left for Sri Lanka towards the end of August. We visited hospitals in two different regions of the country, one being a relatively remote tea-growing region and the other being the capital city Colombo. We were fortunate to have had the fantastic support of Nelun Perera, a microbiology consultant based at the Leicester Royal Infirmary. Originally from Sri Lanka, Nelun went to great lengths to make us welcome and to introduce the national healthcare landscape of her home country. During an eye-opening visit to a rural public hospital, we became aware of serious resource-related problems undermining infection control, including overcrowding, which means several patients have to share one hospital bed. Furthermore, our discussions with local doctors and pharmacists were invaluable for understanding the local concerns around antibiotic prescribing, which mainly focus on treatment cost, and worries about the effectiveness of locally-produced drugs. At an urban public hospital, which had more space and resources available, we met a dynamic Consultant Microbiologist who has been implementing a very successful antibiotic stewardship programme in the hospital for several years, supported by national policies around the restriction of certain ‘red light’ antibiotics. 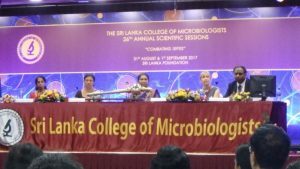 Our subsequent visit to a private hospital highlighted the challenges in implementing antibiotic stewardship in the private sector in Sri Lanka. During a discussion with senior consultants and pharmacists, we learned about the competitive market of private health care in Sri Lanka, and the strong influence of patient demands on antibiotic prescribing. Our fascinating visit to Sri Lanka ended with the Annual Conference of the Sri Lanka College of Microbiologists, where Carolyn Tarrant presented our project aims to an international audience of various disciplines. Over the next few months, our local researchers in Sri Lanka and South Africa will conduct interviews with frontline prescribers of the hospitals we visited, while I’ll be interviewing different UK doctors. We are hoping to learn about the detailed risks and benefits that physicians consider when making their choices about antibiotic treatment. After these inspiring visits, I can’t wait to hear how doctors working on the frontline in South Africa and Sri Lanka describe the influences on their antibiotic use! If you are interested in our findings, do check out the project webpage and follow us on Twitter!